PG&E owns and operates the nation’s largest investor-owned hydroelectric system, providing a safe, reliable and clean source of energy for millions of customers. In this time of extreme drought across California, we are working more than ever to steward our water resources in a responsible manner, including strategically managing water supplies to optimize hydropower and the availability of water for fisheries and downstream users’ needs. Hydropower makes up the largest portion of America’s renewable energy resources, but the licensing process needs modernizing as delays are causing inefficiencies for utilities and can hold up environmental benefits for years, a PG&E vice president told a Congressional committee. 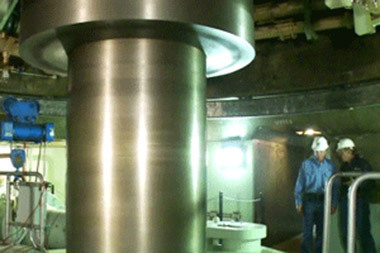 PG&E’s hydroelectric system consists of 67 powerhouses, including a pumped storage facility, with a total generating capacity of nearly 4,000 MW that relies on nearly 100 reservoirs. PG&E actively manages its hydroelectric system to ensure the safety of the public and our workforce, protect wildlife habitat and sensitive species, and maintain popular recreation opportunities for the communities we serve, including campgrounds, picnic areas, boat launches, trails, fishing and whitewater flows. Hydropower also enables us to better integrate wind and solar generation into the grid. As California experiences one of the most severe droughts on record, PG&E is working closely with water districts, first responders and regulatory agencies to help address drought impacts, including limited water deliveries, increased fire danger and environmental impacts. PG&E’s hydroelectric system consists of 26 federally licensed projects. During the license renewal process, we have made it a priority to work collaboratively with stakeholders, such as federal and state agencies, local community members, environmental organizations, Native American tribes, fishing interests and agricultural landholders. Together, we assess the impacts of these projects and work to reach agreement on appropriate resource management measures to include as conditions of the new licenses, such as fish and wildlife habitat protection and recreational opportunities. Many of PG&E’s dams and powerhouses have been in service for more than 75 years, and some of the water collection and transport systems date back to California’s gold mining years. We inspect and maintain our entire hydroelectric system according to strict safety guidelines, ensuring structural integrity under normal and extreme conditions. We continue to make significant investments to repair and upgrade these water conveyance systems to ensure their ongoing safety and reliability. In addition, we continue to engage customers through dam safety outreach focused on populated areas immediately downstream from PG&E dams. For three decades, PG&E has used water for energy storage to help balance daily variations in electric demand at our Helms Pumped Storage Project. Located more than 1,000 feet inside a solid granite mountain, the facility alternately draws water from an upper reservoir to produce electricity when demand is high and pumps it back when demand is low for reuse during the next high-demand period. This ability to quickly ramp up and down plays a key role in integrating intermittent renewable resources, such as wind and solar, onto the power grid. As California’s drought continues to intensify, PG&E is working proactively to safely and reliably operate our hydroelectric system for the benefit of our customers. With the near historically low levels of precipitation, we have conserved water in our reservoirs in the spring so more would be available during the hot summer months, when customer demand increases. To do so, we are continually analyzing reservoir and stream conditions and actively collaborating with regulatory agencies and other stakeholders in individual regions. Together, we are working to reduce the required water releases from our reservoirs in order to lessen the drought’s impact on the environment and prolong availability of water for downstream users’ needs. Battle Creek Salmon and Steelhead Restoration Project. In Tehama County near Mount Lassen, we continue to work with federal, state and regional agencies, conservation organizations and other groups to restore historic salmon runs along Battle Creek. This project is one of the country’s largest cold water fish restoration efforts. Between 2009 and 2019, we are removing five of the eight diversion dams in the area, and retrofitting the remaining three with fish screens and ladders to allow spawning fish to travel upstream through 48 miles of streams and habitat. Butte Creek. In Butte County, PG&E’s DeSabla-Centerville hydroelectric project provides a unique benefit to endangered Chinook salmon and steelhead. An 8-mile diversion canal brings colder water from the Feather River to Butte Creek, increasing spawning and holding habitat for these endangered fish. Additional efforts include work to improve water quality, install fish screens and remove barriers to fish migration. We gauge our hydroelectric performance in a number of ways, primarily through our compliance with environmental requirements for our operating licenses. Our compliance rate in 2014 was 99.0 percent, nearly matching the prior year’s rate of 99.1. 1 This measure refers to miles of stream monitored for its environmental condition, such as water quality/flow, sediment management, habitat quality, fish populations and invasive species. 2 Includes monitoring of bald eagle and other nesting territories at PG&E hydroelectric projects. 3 Special status species include those that are listed under the federal or state Endangered Species Acts or are otherwise given a specific designation by California or a federal resource or land management agency. Monitoring studies are required under various hydroelectric licenses. As the drought in California reaches historic proportions, PG&E will continue to partner with policymakers, regulators, private industry and other stakeholders to manage the availability of water for hydroelectric power while minimizing fire danger and impacts to the environment and the communities we serve. The National Hydropower Association recognized PG&E with an Outstanding Stewards of America’s Waters Award. 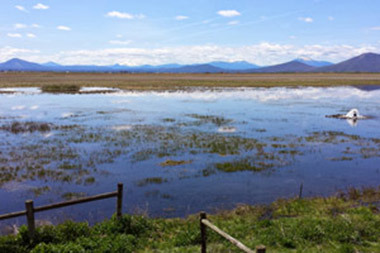 PG&E, in partnership with California Waterfowl Association, restored 500 acres of PG&E property to wetlands. The McArthur Swamp Wildlife Habitat Improvement Project created swales and loafing islands that are flooded annually to create high-quality feeding, breeding and nesting habitat for waterfowl migrating along the Pacific Flyway.